Shamatha (Skt. śamatha; Tib. ཞི་གནས་, shyiné, Wyl. zhi gnas) or 'calm abiding' is also translated as ‘peacefully remaining’ or ‘tranquillity meditation’. There are two central meditation practices on the Buddhist path: calm abiding and clear seeing (vipashyana). The method of calm abiding is to work with the conceptual mind. When you are able to go beyond that and reach the domain of the wisdom of rigpa, it is called clear seeing or vipashyana. tha means ‘to dwell’ or ‘stability’. "Generally for shamatha, we need what are termed the ‘three solitudes’ of body, speech and mind. Solitude of body and speech means to go to a secluded place and remain silent. Solitude of mind means to be free of the mental poisons." 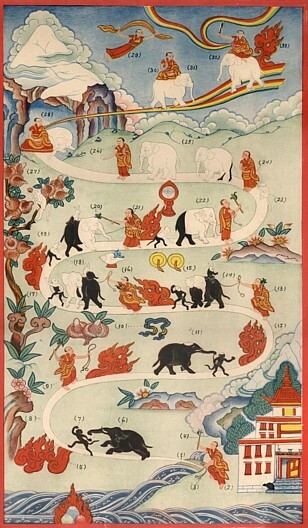 Khenpo Ngakchung explains that shamatha is divided into shamatha with an object and shamatha without a conceptual object. First comes ‘Shamatha with an object’. Keep your mind on positive thoughts, for example love and the samadhi of love, and make use of mindfulness, vigilance and carefulness. Don’t let the mind be distracted inwardly: so do not follow past thoughts, anticipate future thoughts, or be distracted by present thoughts about objects of the six senses. As for how taut or relaxed your mind should be, this is a question of finding your own balance, to suit your own individual makeup. Once you get it right, then just settle the mind without meddling or interfering. In ‘Shamatha without a conceptual object’, the mind does not focus on a single object such as love, but without manipulating or altering the mind in any way, you simply leave it as it is, calm, spacious and at ease. From time to time, you should bring mindfulness, vigilance and carefulness to bear. View: The Rigpa Journal, July 2010, 'Shamatha and Vipashyana', a teaching by Kyabjé Dilgo Khyentse Rinpoche, pages 18-22. Khenchen Thrangu Rinpoche, The Practice of Tranquility and Insight—A Guide to Tibetan Buddhist Meditation (Ithaca: Snow Lion Publications, 1993). Sogyal Rinpoche, A Treasury of Dharma (Lodeve: Rigpa, 2005), pages 140-250.